Here is a nice article on various types of power measurement instruments and their uses. The calorie wattmeter, calorimeter wattmeter, photometric wattmeter, thermo-ammeter, RF voltmeter, reflectometer, in-line meters, and slotted line are covered. Suggestions for selecting the proper instrument for measurement and operation is touched upon. Although the article was written in 1963, many of these instruments - or close descendants of them - are still in use today. Such measurement on communications transmitters is now specified by FCC for many radio services. Methods and types. of equipment are described. Although power input is often used as a measure of transmitter capabilities, the measurement of r.f. power output is becoming increasingly important. In some cases, power output measurements are demanded by the FCC or are required as part of the technical specifications for various services. Domestic Public Radio Services, Aviation Radio Services, and proposed Citizens Band class D requirements all specify maximum power output. 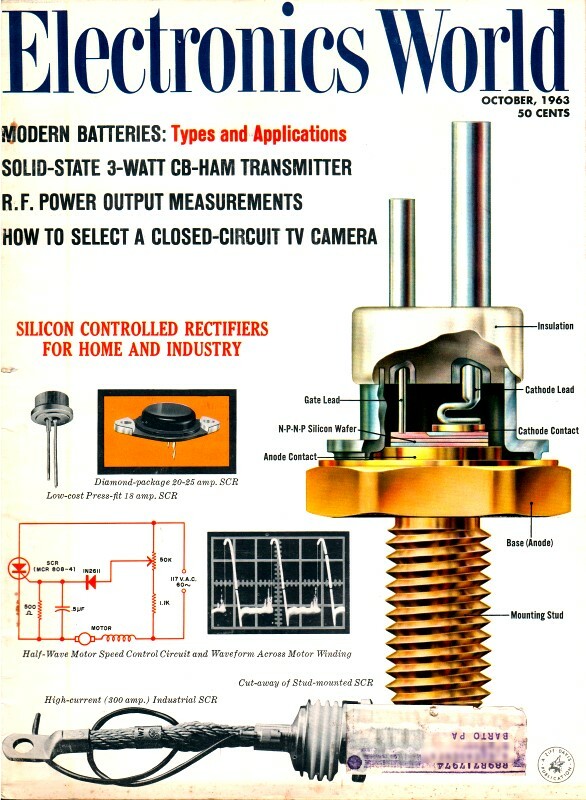 Broadcast stations - AM, FM, and TV - are all required to measure and monitor power output. In addition, power-output measurements can give an over-all check of the efficiency of a transmitter especially when compared with previous readings, and some methods even allow a rough check of modulation capabilities. In some types of instruments, feedline and antenna efficiencies can also be computed or directly read in terms of v.s.w.r. The reading of r.f. power is by no means as simple as reading power at d.c. or low-frequency a.c. Electrodynamometer-type wattmeters, such as are used to read power at 60-cycle a.c. are completely unusable at radio frequencies. As a result, r.f. can only be read by some form of conversion - either converting the r.f. by rectification to d.c. or by converting to some other form of energy and then calibrating the indicating instrument in terms of r.f. watts. Let's consider a few of the more common basic methods. One common and accurate method is called the calorimeter technique in which the r.f. power is converted to heat. In these instruments, some medium for absorbing heat is required. Water, oil, ammonia, and solid dielectrics have all been used, depending on the type of calorimeter and the amount of power which must be dissipated. These systems employ either a static or circulating medium, and a thermopile or other temperature-difference device which indicates such differences on electrical current-reading meters calibrated in watts. Most such instruments, while quite accurate, are slow since time is required to heat the dissipative medium. 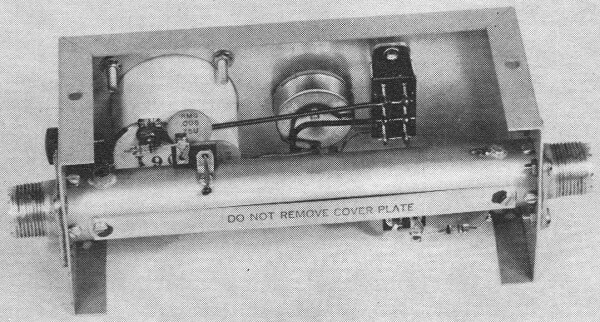 One calorimetric power meter, the Hewlett-Packard1 434A, employs an unusual technique in which a self-balancing bridge is combined with a highly efficient heat transfer resulting in a response time of 5 seconds or less. As can be seen from the simplified diagram of Fig. 1, the unknown r.f. power is checked against a 1200-cps comparison power in the bridge circuit. Two temperature-sensitive resistors serve as gauges. In operation, the unknown r.f. heats an input load resistor. This resistor and one gauge are in close thermal proximity so that heat generated in the input load heats the gauge and unbalances the bridge. The unbalanced signal is amplified and applied to the comparison load resistor which is in close proximity to the second gauge, and nearly rebalances the bridge. The meter measures the power supplied to the comparison load to rebalance the bridge. Efficient heat transfer from the loads to the temperature gauges is accomplished by immersing the components in an oil stream. While quite accurate and reasonably fast for a calorimetric system, this instrument will read powers only to 10 watts, at frequencies from d.c. to 12.4 kmc. Being a laboratory instrument, it is quite costly for applications involving routine service work. Fig. 1. 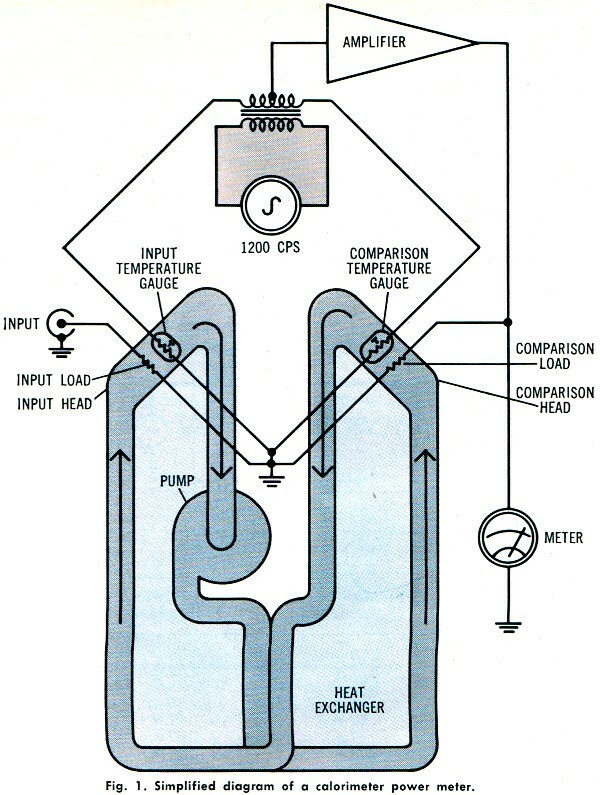 Simplified diagram of a calorimeter power meter. Converting the r.f. power to light has been used and is known as the photometric technique. In some applications, a special lamp containing two identical filaments is used. One filament is fed from the source of unknown r.f. power, while the other is fed from d.c. or low-frequency a.c. When the two filaments are of equal brilliance, the r.f. power is assumed to be the same as the d.c. or low-frequency a.c. power. A single filament lamp, read by a photocell, may also be used but some method of calibration is required. These photometric systems have limited usefulness because lamp filaments make poor dummy loads. They have considerable reactance above 2 mc. and the resistance may vary with the amount of current passing through the filament of the lamp. Full-scale values as low as 10 ma. and as high as 15 amps. are available from some manufacturers. External thermocouples are offered by some firms for use with their meters. The r.f. current measuring systems which employ thermo-couple ammeters, or thermo-ammeters as they are usually called, are quite accurate in common usage and make one of the simplest instruments when only r.f. power transferred into a dummy load or into an antenna system is to be measured. Thermo-ammeters consist of a thermocouple and a d.c. moving-coil meter movement. The thermocouple is made of two dissimilar metals, joined at one end. If the junction of these metals is heated, a d.c. voltage is produced at the free terminals. This voltage is proportional to the heat difference between the hot and cold ends. 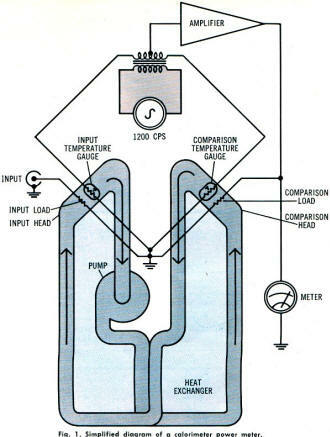 A practical thermocouple meter consists of a heater through which the r.f. current flows, a thermocouple attached to the heater element, and a d.c. moving-coil meter connected to the free ends of the thermo-couple. The d.c. voltage at the free ends causes direct current to flow through the meter which is calibrated in r.f. current. Power is then computed from Ohm's Law, P = I2R, where R is the value of the load resistor used. Because deflection of the meter is proportional to the amount of heat in the heater wire, which is proportional to the square of the current passing through it, the thermo-ammeter has a square-law scale. In this type of scale, the lower end is quite crowded. For best accuracy, the full power should be read at about 70% of full scale, but the meter is readable over the range of 3 or 4 to 1, that is, a thermo-ammeter with a full scale of 1 ampere can be read down to about 0.3 ampere. Such ammeters cannot be shunted for use on other ranges, since any shunt will make the meter quite frequency sensitive. Thermo-ammeters are good up to about 200 mc. depending on the construction of the heater wire. Some thermo-ammeters are made with a thin-wall, hollow heater wire which behaves much like a waveguide, making the instrument usable at higher frequencies. Regular thermo-ammeters are made by a number of meter manufacturers. In appearance, they look like any other panel meter, except for the square-law scale. They are comparable in price to other good-quality panel meters. Fig. 22,3 shows two such units. The larger meter provides a more easily read scale. 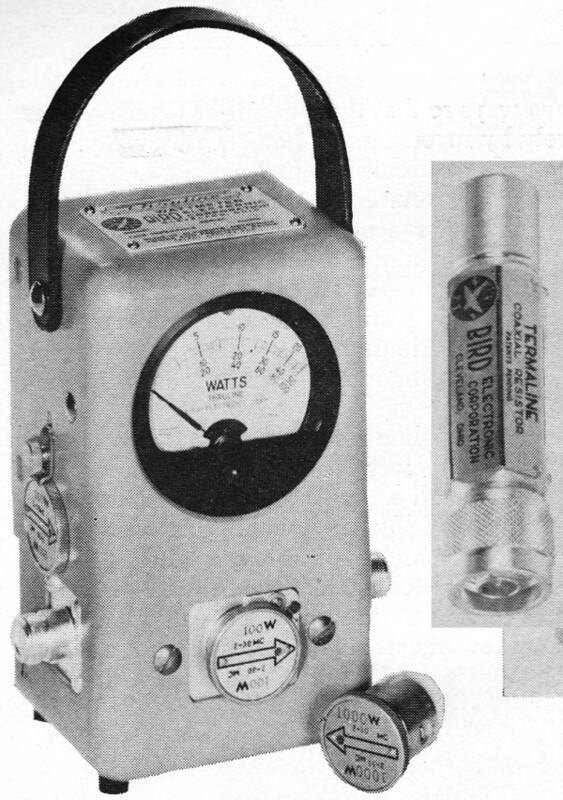 Both have proved quite accurate and easy to use with CB transmitters when equipped with proper dummy loads. They may also be used in series with the center conductor of a coaxial cable as an indicator of power being transferred to the antenna, However, they should not be used with the antenna feedline as a load for tune-up purposes. When used in this way, they may have a tendency to add forward and reverse currents, giving a false indication of output power, resulting in mistuning of the transmitter coupling circuits. They are also useful as a rough indication of modulation capabilities since speaking or whistling into the transmitter microphone will cause the meter to move up scale. Fig. 3A is a schematic of a typical thermo-ammeter with dummy load. The load is made up of 2-watt carbon resistors in parallel. The closer the resistance of the dummy load matches the antenna feedline impedance, the more accurate will be the readings on the thermo-ammeter. For up to 8 watts, three 5% 220-ohm and one 5% 200-ohm carbon resistors (all rated at 2 watts) in parallel, will come close to approximating a 52-ohm load. For higher power transmitters, parallel resistor combinations can be made in the same way. Special non-inductive carbon resistors are available for this purpose or standard commercial dummy loads can be used. If the load is constructed, leads should be kept as short as possible and adequate ventilation allowed for heat dissipation. Fig. 3. (A) Thermo-ammeter schematic showing use of dummy-load resistors. (B) The basic peak-reading r.f. voltmeter. For power up to 13 watts into 52 ohms, a 0 to 500-ma. meter will serve quite adequately. 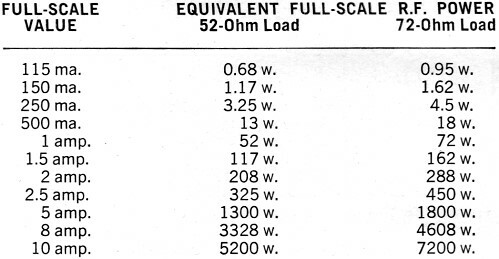 Table 1 lists commonly available full-scale values, together with interpreted wattage ratings for both the 52- and 72-ohm loads. Table 1. 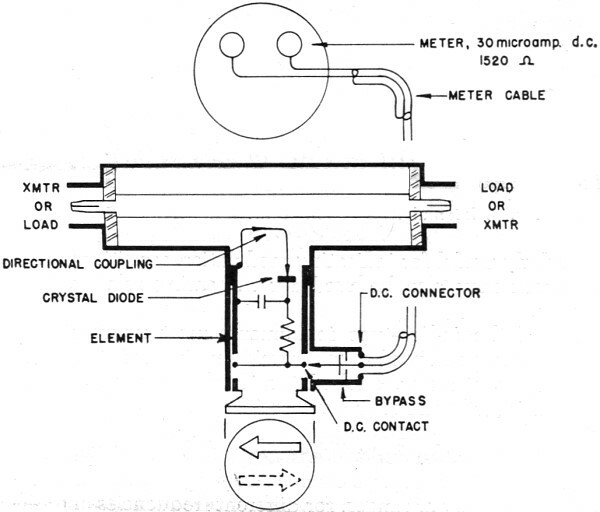 Common thermo-ammeter full-scale currents, powers. Radio-frequency voltmeters are commonly used as r.f. power measuring devices. Power is derived from the Ohm's Law formula, P = E2/R. In some commercial models, these units are combined with systems which also read v.s.w.r. directly or indirectly, or both forward and reflected power. Crystal diodes are commonly used, but since such rectifiers have a tendency to vary in resistance with applied voltage, a swamping resistor (R1 in Fig. 3B) is used. The time constant of C1-R1 is made large with respect to the period of the lowest radio frequency to be measured. This condition can be met if R1 is at least 10,000 ohms and C1 is 1000 pf. C2 merely provides additional r.f. filtering for the meter. Such voltmeters have to be calibrated and for this reason are not too popular as construction projects. 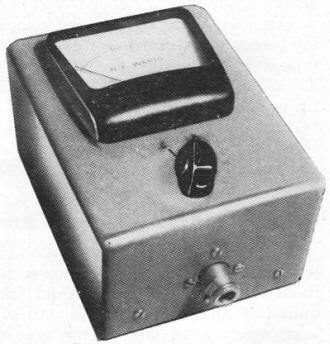 A typical commercial meter, the Electro Impulse Laboratory4 Model AM-6 is shown in Fig. 4. This meter is useful over the range 100 kc. to 200 mc. It is a dual-range type, employing a voltage divider for full-scale values of 1.5 to 6 watts, and a full-scale accuracy of 5%. The voltage-divider characteristics are such that the voltage divisions are the same for d.c., 60-cycle a.c., or r.f. This makes for easy calibration and checking against known standards. Other models are made for full-scale wattage readings up to 1500. This meter is intended for transmitter measurements only and cannot be employed for feedline or antenna measurements. Fig. 4. A typical commercial dual-range r.f. wattmeter unit. Other examples of this type of device, but able to measure higher powers, are shown in Fig. 5. Fig. 5. These Cesco absorption wattmeters use circuits of the type shown in Fig. 3B. Units are available for powers up to 1500 watts. The dummy load resistors that are used are special non-inductive types that are submerged in oil. These instruments are bridge-type voltmeters, consisting of one or two voltmeters, and employing resistor, resistor-capacitor, or capacitor bridges. Rather than being directly connected to the feedline or transmitter, they employ a short length of coaxial line and a pickup loop so that energy is induced by mutual inductance and capacitance from the traveling r.f. wave. When two bridges or detectors are used, the instruments can be made to read either forward or reflected waves on the feedline and can thus be calibrated in both watts and v.s.w.r. In some commercial instruments, the pickup device is a special element which can be placed in the instrument in one of two ways so that the forward or reverse waves can be read merely by reversing the element physically. 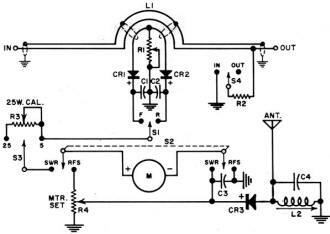 A typical reflectometer circuit is shown in Fig 7. 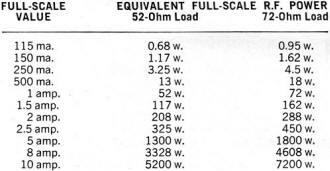 For relative readings and the computation of v.s.w.r., no special calibration is required. But for accurate power measurements, the instrument must be calibrated for each specific frequency range, or furnished with plug-in elements for different frequencies and different power ranges. Because instruments of this type draw relatively little power, they may be left in the feedline as permanent power monitors or to determine antenna conditions. Fig. 7. Basic circuit diagram of a reflectometer unit. Fig. 6 shows a typical in-line instrument manufactured by Cesco5 and calibrated in power for CB use. This is a basic dual-bridge instrument with a single indicator. Forward or reverse power is selected by a switch. The v.s.w.r. is read by adjusting a potentiometer for full-scale reading in the forward direction, then switching to the reflected direction and noting the reading directly in v.s.w.r. Like all diode-type instruments, it shows few effects from sidebands and so is not particularly useful for indicating modulation conditions. This instrument may also be used for measuring relative field strength. Fig. 6. Internal view of in-line r.f. wattmeter for CB. One of the in-line-type instruments most popular with manufacturers and professional service engineers is the Bird6 "Thruline" wattmeter, dubbed the "Birdie" by many of its users. This instrument has a number of unique features and, as a professional instrument, enjoys widespread use in both military and civilian applications. This wattmeter employs changeable plug-in elements, provided in a variety of ranges, for different frequencies and different power applications. Elements are made in six frequency bands from 2 to 1000 mc. and in various power levels from 5 watts full-scale to 1000 watts full-scale, with an accuracy of 5% of full-scale. This instrument and a coupling element are shown in Fig. 8 (left). A simplified schematic is given in Fig. 9. 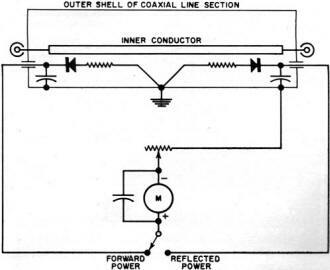 A coaxial resistor, designed to be used as a dummy load for transmitter bench checks is shown in Fig. 8 (right). These resistors are made in a variety of power ratings. The one shown is an air-cooled, deposited-carbon type designed for 5 watts dissipation. Fig. 8. (left) "Thruline" wattmeter with changeable power element. (Right) A coaxial dummy load resistor rated at 5 watts. Fig. 9. 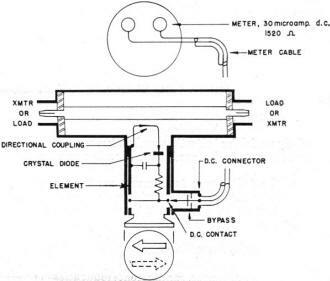 Simplified schematic of Bird wattmeter. R.f. power can be measured in either direction depending on the plug position. The Bird wattmeter consists of a short, uniform section of air line, the characteristic impedance of which is exactly 50 ohms. The coupling element is prominently printed with an arrow indicating the direction of the traveling wave being read. Energy is produced in the coupling element by both mutual inductance and capacitance from the traveling waves of the line section. Inductive currents flow according to the direction of the wave. Capacitive currents are independent of traveling-wave direction. Therefore, assuming the element remains stationary within the air line, current produced from the waves of one direction will add in phase, while those traveling in the opposite direction will subtract in phase. As a result, and because of the design of the element, only the wave desired (forward or reflected) will be read, while current from waves of the opposite direction will be cancelled out almost entirely. A directivity always higher than 35 db will result. While v.s.w.r. 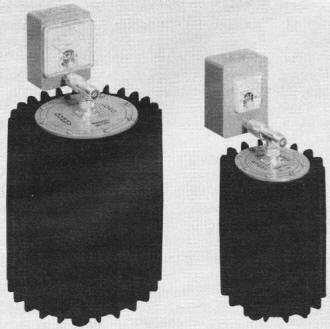 can be computed with this instrument, the manufacturer recommends the user think in terms of power ratios, forward to back. A ratio of 10% gives a v.s.w.r. of less than 2 to 1 which is, for all practical purposes, a good antenna installation in communications work. Lower standing-wave ratios yield little in the way of improved performance, although in TV, v.h.f. omnirange transmitters, and FM multiplex systems, the lowest possible standing-wave ratio is desired. The r.f. line section of the Bird wattmeter may be removed and permanently installed in the transmission line. The d.c. meter is connected by cable to this line and may be installed at considerable distances from the line section. Cable lengths up to 25 feet are available from the manufacturer, although any shielded cable such as RG-58/U may be used. Another instrument employing the reflectometer principle, but also including a built-in load resistor and a field-strength meter, is the General Radiotelephone7 Model 615. This instrument is calibrated for 27 mc. but may be used in the range 27-54 mc. As a power meter, it will read either power in the feed line, forward or reflected, or power absorbed by a calibrated internal load resistor. Power may be read on either a 5- or 25-watt scale. A peaking coil is provided for field-strength measurements on frequencies higher than 27 mc. A schematic of this instrument is shown in Fig. 10. Fig. 10. 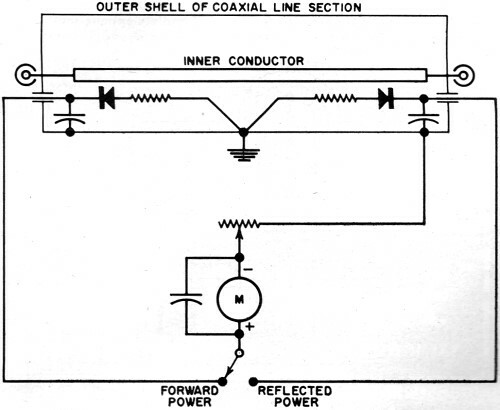 Schematic diagram of the General Radiotelephone multi-function unit. Device can also be used as field-strength meter. At frequencies in the u.h.f. range, the slotted line is often used, especially for reading v.s.w.r. While this type of instrument measures with a high degree of accuracy, it is quite expensive since it is a precision-machined device slightly longer than one-half wavelength. Consequently, it is considered impractical at frequencies below 460 mc. It is certainly not something that can be constructed in the shop, unless precision machine tools are available. Basic information on slotted lines can be found in standard texts. The type of wattmeter you select will depend on many factors - your intended use, your pocketbook, accuracy desired, the band on which you are operating, as well as other considerations. You can pay as little as $19.95 for a factory-assembled and calibrated CB instrument to as high as $1600 and more for a laboratory calorimeter. In between are the professional standards used by manufacturers and communications engineers, ranging in price from $40 to $200 or more. If you are a radio amateur or CB enthusiast, you will find the less expensive reflectometers and multi-function bridges quite adequate for your purposes. If you are a professional communications service engineer, you will probably require the higher accuracy of the more expensive instruments. Use will also determine which type of meter you want. If you are reading strictly transmitter power capability on the bench and into a dummy load, the straightforward wattmeters are all you will need. For base-station communications equipment employing a single frequency, feeding a high-quality resonant antenna with very low standing-wave ratio, the simple wattmeter will be sufficient. But, for multi-channel equipment, or wherever antenna matching problems may be encountered, reflectometer or in-line types of meters are much to be preferred because of their ability to read both forward and reflected waves. Instruments of the in-line type, which are to be left in the line, should be considered as part of the transmission line when tuning a line to an antenna, especially at high v.h.f. and u.h.f. frequencies. If they are removed from the line, an equal length of coaxial cable should be fitted with the same type of connectors and installed in its place. Where antennas require tuning, the best procedure is not to whack away at the feedline, inch by inch. Instead, do this: First, tune the transmitter to a wattmeter equipped with a dummy load equal in impedance to the system you are using. Next, if the antenna requires tuning, cut the antenna to the desired length for the principal frequency being used. Do not attempt to alter the design of the antenna. Install it according to the manufacturer's recommendations. If this is done, you can be fairly certain the v.s.w.r. of the antenna will be less than 2 to 1. If you measure the v.s.w.r. and find it less than 2 to 1, leave it alone. You won't improve communications noticeably by any matching techniques. But, if you are finicky about v.s.w.r. and have nothing better to do, whack away. Who knows, you may achieve what the author once heard on CB, "My v.s.w.r. is less than 1 to 1!" 1. Hewlett-Packard Company, 1501 Page Mill Road, Palo Alto, Calif.
4. Electro Impulse Laboratory, Inc. 208 River St., Red Bank, N.J.
7. General Radiotelephone Co., 3501 W. Burbank Blvd ., West Burbank, Calif.